A passenger train smashed into a truck at a level crossing in South Africa on Thursday, killing at least 14 people, injuring 190 and throwing several carriages off the rails. Emergency service workers work at the site where a train crashed into truck on January 4, 2018, in Kroonstad, Free State Province. At least 12 people were killed and 180 injured in South Africa on January 4 when a passenger train collided with a truck and burst into flames, an official said, as rescuers searched for survivors. Flames ripped through the twisted wreckage and choking black smoke rose into the air as desperate passengers clambered out of the train to escape the inferno. Tiaan Esterhuizen, who was travelling on the train as he returned from holiday, attempted to rescue three women who were trapped in a burning passenger wagon. “I saw around 12 cars on their side and one was already burning. We heard some women screaming when we came closer‚ so a few of us climbed over the cars,” he told the Times LIVE news site. “Two of the women were sort of on top of each other. Another was further back. Her legs were trapped. One of the women was shouting that there was a baby inside also. Rescuers rushed to the scene to search for survivors and treat the injured. Officials warned the toll could rise as operations continued to clear the crash site. “Police are investigating. The truck driver was taking chances... that cost lots of lives,” Transport Minister Joe Maswanganyi told reporters at the scene. The Shosholoza Meyl rail company, which operates long-distance trains in South Africa, said the train travelling from Port Elizabeth to Johannesburg collided with the truck at about 09:00 am (0700 GMT). 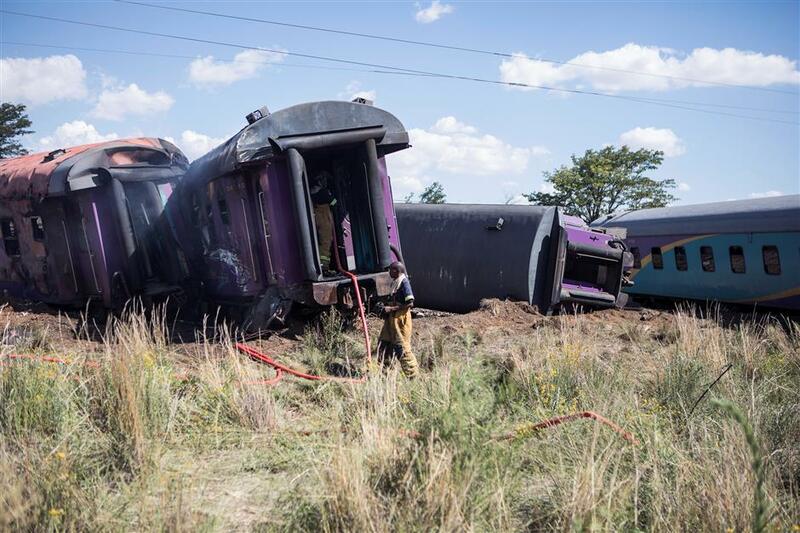 It said the truck had made an “untimely” crossing of the tracks when it was hit by a train at high speed, between the towns of Hennenman and Kroonstad, 200 kilometres (125 miles) southwest of Johannesburg. One of the derailed carriages was the power generator behind the locomotive car. It caught fire and the flames spread rapidly. Shosholoza Meyl said there were 429 passengers on board, though Maswanganyi put the number at 730. “The death toll has increased to 14,” provincial government health spokesman Mondli Mvambi told AFP, adding that at least 190 people had been injured -- two of them critically. “It is feared that they could find more bodies as the search, recovery and rescue work is ongoing,” he said. The number of injury reports also varied widely in the immediate aftermath of the crash. “We still have to lift the carriages to see to whether there are any other people that are still trapped there or not. We still don’t know what is underneath,” said one railway official at the accident site, promising a full investigation. Some victims were treated on a strip of grass beside the railway line while others were taken to hospital. Uninjured passengers waited on a nearby road, some of them carrying their luggage. The New Year is a busy period for transport in South Africa, with railways and roads carrying passengers returning to work after the holidays. In 2015, 15 people were killed in eastern South Africa when a mini-bus taxi fell from a bridge onto railway tracks and was hit by a train.